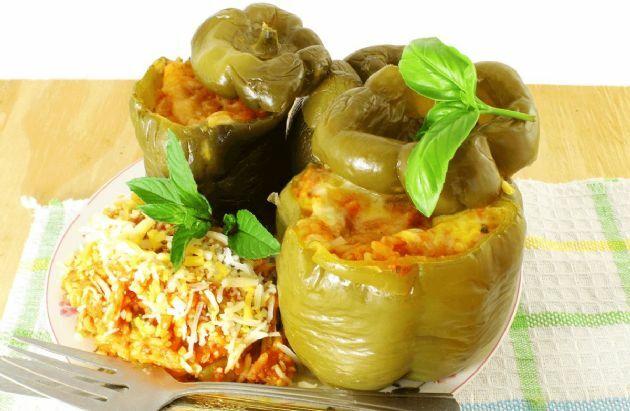 This stuffed bell pepper recipe is really delicious! You can use red bell peppers if you like that flavor better. It incorporates your protein, starch, and veggies in one neat package! Brown rice is used for an added nutritional punch. This stuffed bell pepper recipe is really delicious! You can use red bell peppers if you like that flavor better. It incorporates your protein, starch, and veggies in one neat package! Brown rice is used for an added nutritional punch. Cut bell peppers in half lengthwise; discard seeds and membranes. Place in a casserole dish - the bottom of the dish should be covered with a thin layer of tomato sauce. In a pan, add canola oil and sautee the onions until translucent (5-7 minutes). Add minced garlic and cook for 2 minutes. Then add the ground turkey and brown. In a large bowl, combine the cooked ground turkey, brown rice, and diced tomatoes. Add salt and pepper to taste. Scoop mixture into each bell pepper half. Bake, covered, for 30 minutes. If desired, uncover, sprinkle mozzarella cheese on top, and bake an additional 5 minutes. Recipe submitted by SparkPeople user KS76017. what a great idea to add taco seasoning! good call!